Nice of you to stop by! Oh my...you caught me in my apron! What's that, you like my apron? Why thank you very much! Yes, I did make it myself, thanks for asking. I got the fabric at a Jo Ann fabrics in Moscow, Idaho, when we were there last October. And I made up my own pattern, too! It has just the right size waistband, just the right size pocket and it's just exactly the right length for me. 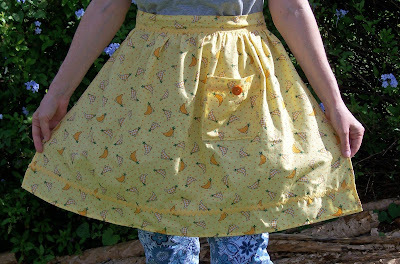 Yes, I am quite in love with this apron myself. Did you see the black wagon wheel button? And the black and white dotty ribbon? And my special pocket that's just the right size? Yes, I love my new apron. I wish I could wear it somewhere besides my kitchen and my blog...but oh well...all the important people get to see it, right? This is the view from my kitchen window today. In the distance is the Anahola mountains. 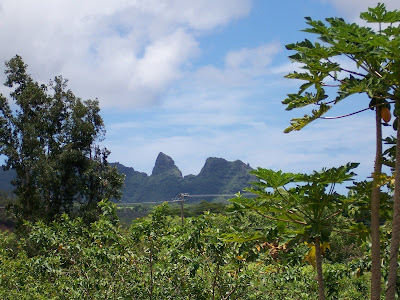 I'm not sure what the Hawaiian name is for this particular set of mountains, but around here, the pointy one in the middle is affectionately known to Kauaians as "Kong." That's because it looks like King Kong's profile. Do you see him? This is not the best angle to see the profile perfectly, but that's okay, because I know it's him. He's looking toward the ocean. There's a papaya on the papaya tree out there that's too tall to reach--looks like the birds will be having dessert on us today. Also in the kitchen today, I'll be using my new coasters that my son's sweet girlfriend Angela made for me as a Christmas gift. Aren't they wonderful? I love these! They are so handy. You can even insert the bottom of your glass stem in them and they stay on, so you don't have to look for a coaster every time you set your glass down. Angela made them from this web tutorial: Criss Cross Coasters at Allsorts. She said they were a lot of fun to make; I think I'll be making up some for Christmas this year. It's always great to have a handmade gift ready to go when unexpected friends drop by to look at your new apron. Combine water, cornstarch and shoyu in a little bowl and keep handy. Heat oil and butter in large skillet or wok. Stir fry broccoli a minute or so. Add garlic and stir fry some more, coating broccoli about 3 more minutes. Add mushrooms and let them release their juice for a minute or so. When everything looks al dente (broccoli should still be bright green and crisp-tender), pour in the cornstarch mixture and toss. Let the cornstarch thicken--it happens pretty fast. Serve immediately while still hot. Variations: sometimes I add a little crushed ginger in with the garlic. I also sprinkle this with toasted sesame seeds when I remember. Whew! Looks like I'm all martha-ed out for the day. You'll have to think of your own dessert. I'm off to finish the toe of my Cable Rib sock, which has been slow going at 10 rows per night. 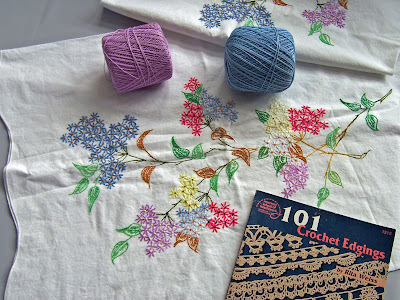 Tonight, I'm doing my last kitchen-y thing of the day...the Kitchener Stitch! This is Madison. 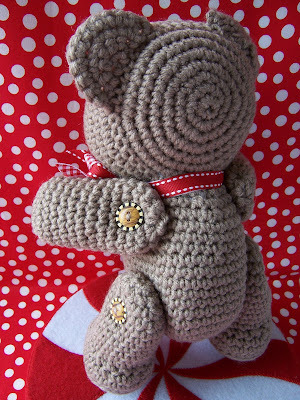 He's a crocheted bear that I made for absolutely no reason at all except that I wanted to. Madison stands about 9" tall and he's made out of Patons Canadiana acrylic in "Beige." 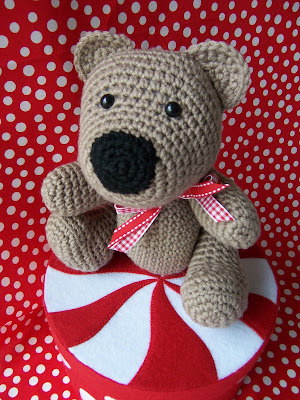 Madison is a Carolyn Christmas Savage Gourmet Crochet pattern and he was very easy to make. I love his shiny little eyes, don't you? This is Mr. Bigglesworth. He has jointed limbs, too...but no buttons. Daddy lets him in in the early morning (he's a night owl kitty) and he sleeps at the foot of our bed with me until I wake up quite a bit later. I'm a terrible insomniac most nights--it takes me HOURS to fall asleep every night, so I wake up when my body decides that I'm rested, hopefully before the phone starts ringing or the postman comes to the door (embarrassing). Uh oh...digression ahead, but here it goes. Is anyone else out there an unwilling night owl? Like...YOUR WHOLE LIFE?? Do you watch as the whole world pops out of bed smiling and fresh as a daisy while you're still trying to remember who you are? Seriously--it takes me about a half hour to emerge from my dreams and figure out what's reality and what's not. If you've ever taken a quilt class from me, you know that we don't start until nine. Nine is still a little too early for my brain to be in charge of my mouth, but most people don't want to start around noon when I'm truly coherent. At nine, I can talk without drooling on myself, but only if I've had a couple of lattes and a cranberry scone. Oh, how I envy morning people. How do you do it? I guess you could ask me the same question about being energetic when I'm up calculating yardage or writing a pattern at 2 a.m. Sometimes my body and mind are so active that just give up, get out of bed and go work out on my elliptical trainer. Or sew, or knit, or write my blog post for the next day. It IS nice and quiet here at night and the phone doesn't ring and no one comes to the door--so I guess it does have some advantages. Okay...who do you think I get told that I look like? I could make this a quiz, but I won't keep you in suspense. 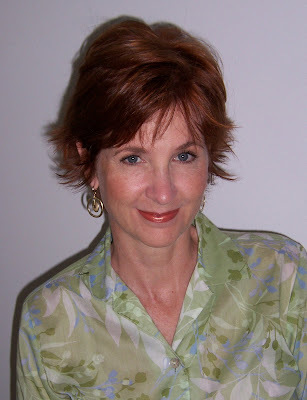 I grew my hair out from this haircut because I got tired of people telling me I looked like Reba McEntire. In high school (1976), I was always told I look like Olivia Newton John! Someday, I'll scan in my high school picture and see if you agree. Today, some eye candy because I have a lot of sewing to do and I have to be brief. Today's post is self-guided and self-explanatory. 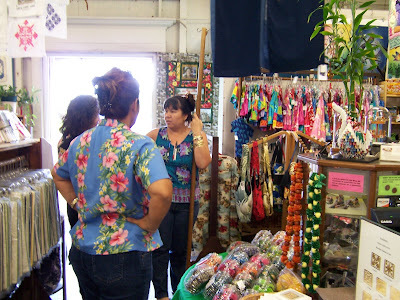 Be sure to wear your sunglasses because it's going to be sunny and bright in Hanamaulu, and very colorful, too! Fasten your seatbelts, and have a nice day in Paradise. 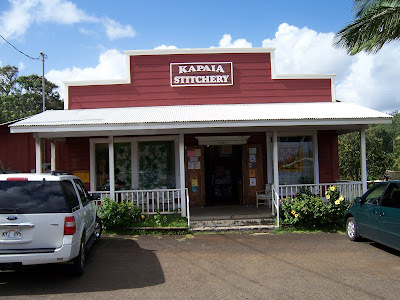 Ladies and Gentlemen....presenting my LQS.....KAPAIA STITCHERY!!! These fabrics I cut for postcard kits looked so lovely that I had to take a picture before I packaged them up. 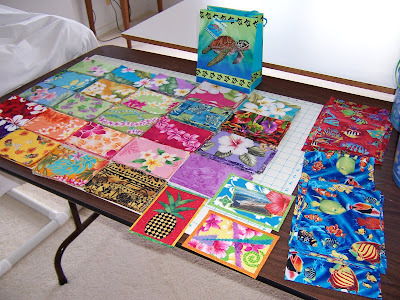 I've often been tempted to try a watercolor quilt with Hawaiian prints--and the picture above gives you an idea of what one would be like. Whaddya think? Too much? Click on the pictures to get a bigger view--but be prepared--they're COLORFUL. 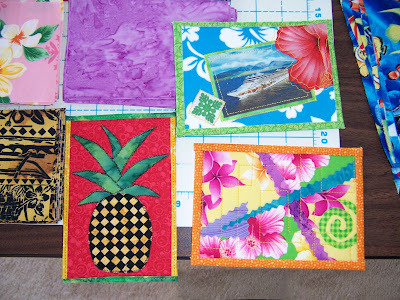 These are a few of the quilt postcard class samples. The little ship was a picture I downloaded from the internet of the Pride of Hawaii (thanks for the idea, Jeni H). I printed them out on muslin so we could have a picture of the ship we were sailing on. These are so much fun to make--but even funner to get in your mailbox. For photos of the cruise, you can click on the link in the right margin to see my Flickr photoset. Today, I am presenting a quick tutorial for all of you who are considering taking lovely photographs of your quilts for web or blog posting. As a veteran of say...oh...maybe TWO good photographs of my quilts...EVER...I am not qualified to write a tutorial on how to take a good picture. It is for this reason, I offer the next best thing, and that is: how NOT to take good digital picture of your quilt for public viewing. Step Two: Make an EXACT replica of the first quilt for the next shop that calls and wants a sample of your Hula Hut pattern. This time, write down the name of the shop you send it to; also remember to ask for it back one day. 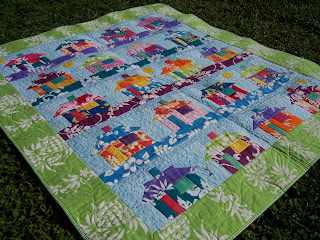 Step Three: Decide your blurry quilt picture is not up to today's blog standards and will NOT convince anyone to buy a Happy Hula Hut quilt pattern from you. The tiny, flat and splayed museum look in quilt photography is dated. You need something more hip and modern. 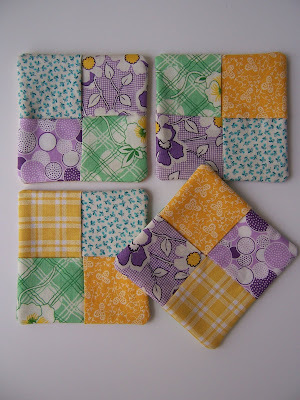 Decide to dig out all your old quilts from their storage lockers and photograph them looking more "natural." No more "Look at me, I'm a flat, square, unlumpy, non-wrinkled quilt, getting my picture taken in a white studio!" The new look in quilt photography is limp and drapey and outdoorsy; like you've just come upon a quilt grazing like a wild animal in it's own habitat. Why, here's one now, grazing on our plumbago hedge! I'll take a picture of it!!! Uh oh. I think I killed it. 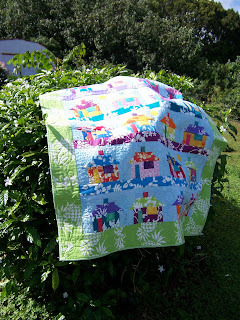 Step Five: Give up on the bush idea and lay the quilt on the grass. It's flat, but at least it looks somewhat "nature-y." Step Six: Decide that maybe you should've ironed the big storage crease out of the middle of it before you decided to take its picture. But it doesn't matter anyway, since this is a terrible camera angle and it's starting to rain anyway. Step Seven: Give up. You're wet, your camera is wet, your quilt is wet, and you've decided that you're a quilter, NOT a photographer. Go back in your house and sew something. P.S. A mahalo to my new blog friend Cinnamongirl in snowy Illinois, who mentioned my blog in her text...and also showed me what my blog page looks like on her new dreamy pink Blackberry! Make sure you scroll down past all those lovely tomatoes and snow and look really close at the tiny screen. It's my blog!!! On her cute little Blackberry! Oh, I think I need one of those, don't you? I've been quilting for 21 years now and I still don't know what kind of quilter I am. I can't even answer the most basic questions, like: what kind of quilts do you make? What colors do you tend to use? Do you hand quilt or machine quilt? Hand piece or machine piece? And so on. The truth is, I do it all. I do bright colors because I live in Hawaii and I sort of HAVE to--I'm not all that sure I like bright colors, but I don't dislike them either. I lean toward pastels, but I do get tired of them and long for splashes of jewel tones or two-color quilts. I do lots of things by hand, but I do lots of things by machine, too. It seems like I've done one of everything. I pieced the Mariner's Compass above in the mid-nineties sometime. I've never liked the colors all that much, and it looks a little dated now, but it's still pretty impressive, no? But I look at that piece and think, "I did that? I designed and drafted and executed those teensy-weensy points all from my pencil drawing on freezer paper? Whew. Glad I won't have to do that again!" 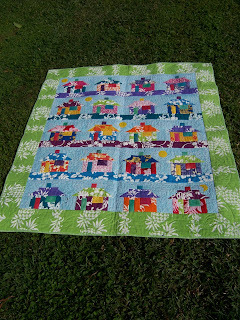 Lousy picture, sorry, but it's a cute quilt, huh? 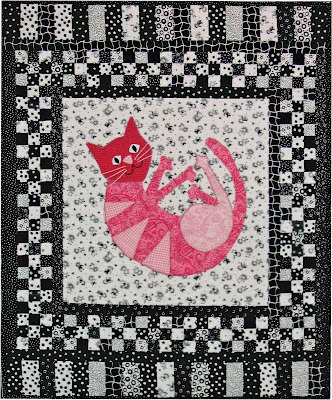 My friend Jo Anne and I designed and made this quilt for our friend Paige. 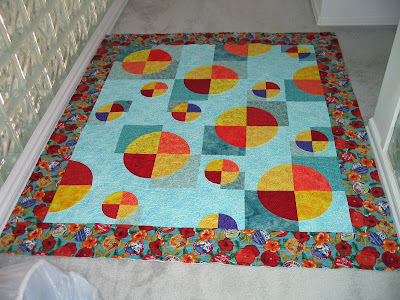 The curved piecing was fun and yet the quilt is pretty simple overall. I'd like to try it again in old fabrics...I've got a red and turquoise urge coming on. 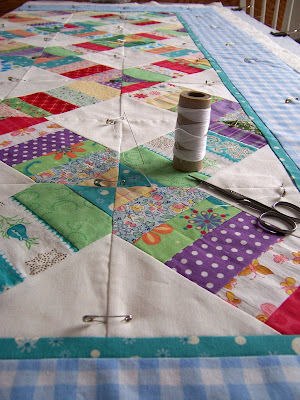 Isn't this great about quilting? There's always a "next one" plan in the works. I better live a loooooong time. Crocheted Edging Color Help? Anyone? 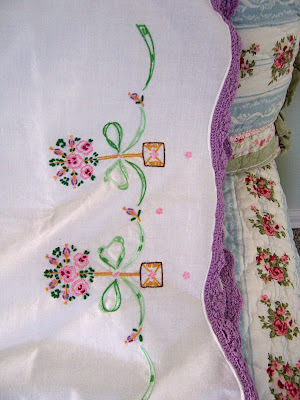 Gosh...is there any thing prettier than a crochet-edged embroidered pillowslip? If I could, I would wear one. I've been trying to get my pictures somewhat organized lately and I keep running across little gems like this one: I never noticed it before, but all of our dresses are homemade in this picture! This is around 1965 or so, and that's just the way it was done back then. 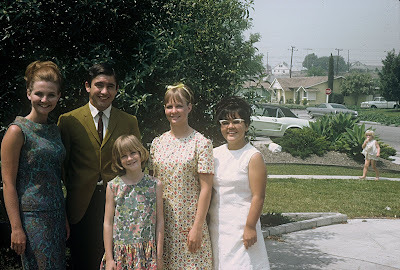 I'm standing in front there, and I had obviously been called away from playing outside with the neighbor girl (to the far right) who must've been distracting to my stepfather, who included her in the family photo shoot. Ah well, there were so many of us (six), it was sometime hard to keep track of which ones were his. From right to left: my sister Judy, stepbrother Bill, me, sister Jane Ann, stepsister Donna. Not shown is stepbrother Harold. 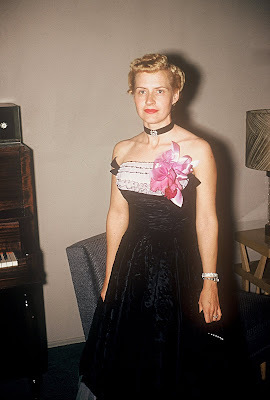 She always made her own clothes, but not this dress. It must've been a special occasion to be able to own a store-bought dress, and the rare event must have prompted this picture. I love the velvet ribbon and cameo pin choker she rigged. Dressing up must've been more of an adventure back then; a treasure hunt of what you had and what you could put together. My mother always LOVED clothes and shoes. I did not inherit her love of clothes and I especially loathe shoes (shoes=foot binding torture devices meant to hobble women so that they can't run away or get anything constructive done because of all the limping around in unbearable pain).I detest shoes and I detest shoe shopping. I'd rather shop for a bikini than for shoes...and that's really saying something, because I'd rather stand in line at the DMV than do either. This was four years ago and she's still going strong, still accumulating shoes and sending me clothes for Christmas, because god knows, I still can't pick out my own. Thanks, Mom. Funny...he doesn't seem to mind that some of my nine-patch corners aren't perfect or my machine quilting could stand improvement. Why should I care if HE doesn't? 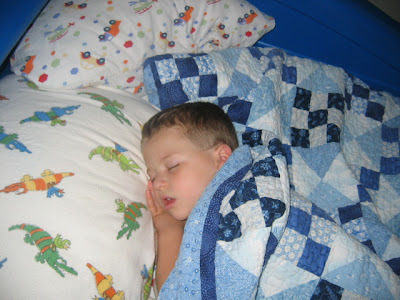 Sweet little Dom is sleeping under a Nine Patch and Hourglass quilt that I made for him when he was a newborn. 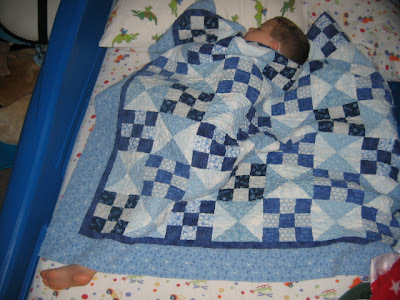 The quilt is actually a twin size (I think it's turned sideways here), so I know it will grow with him. I'm having a hard time figuring out what else to say. I think the first picture and the title is all that is required. I had forgotten completely about this quilt. I was looking through some of my old quilt pictures yesterday, and came upon this. I vaguely remember that I made it in one day, and sent it off to the Kauai Humane Society the next, so I didn't much get a chance to contemplate it. I'm surprised that I took a picture of it, as I usually forget in my haste to get a quilt handed off to the proper recipient. So it got me to thinking: how many quilts have I made that I don't remember at all and didn't take pictures of? What's more staggering is to contemplate how many quilts I have made altogether since I started in 1987! I sometime get this exact question in interviews, and it makes me freeze up like the proverbial deer in headlights. I can't even begin to estimate! Not a clue. Especially when I forget making entire quilts, like the one above. I suppose I'll just have to make up an answer. 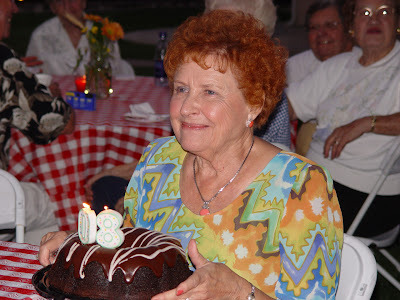 "How many quilts have I made? Two thousand thirty-six at last count. But wait...that doesn't count all the imaginary quilts I've made in my head. Okay.....TWELVE thousand thirty-six. 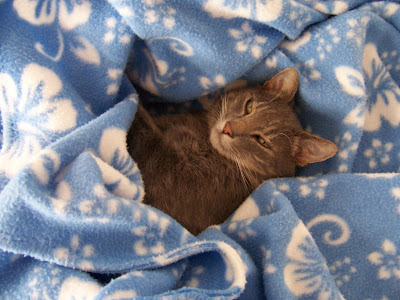 I think the kitty quilt above was number nine thousand ninety two. But let me check my QUILTOMETER just to be sure....oh yes, here it is. Nine thousand ninety two. Beginning quilters, take note. Start your Quiltometers. If you get to be famous, you'll need to be prepared. Speaking of forgotten, I wandered around to my rose garden yesterday and discovered these beauties. In JANUARY, people. Roses. In January. Kauai. 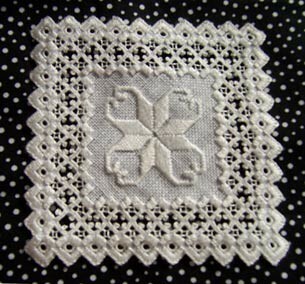 And yes, I crocheted the doily, thank you very much. I do love my doilies. 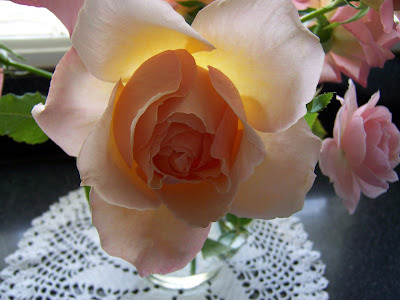 I only grow roses so that I have something to set on my doilies, actually. And as of this date, I've made thirty-two doilies! Okay, I made that number up, too. Dang. Looks like I need to buy a doilometer. PS. 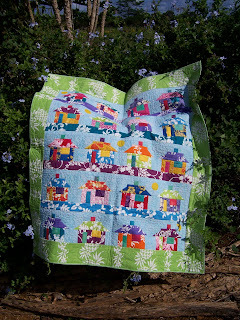 The Kitty block above was made from the book, Curl Up Quilts by Goldsmith and Jenkins. I don't remember where I got the border idea and I'm too lazy to go check the book to see if I got it from there...but eh...whatcha gonna do? Making aprons. I knew I would love it, but...wow. I'm hooked. I've already made another besides this one, but it's raining outside, so I'll have to wait until later to photograph it. Have you ever made something that you just think, "Wow. I love doing this. I want to do this some more. No...that's not quite right...this is ALL I want to do. Forget eating and sleeping. Definitely forget cleaning. I just want to do THIS. FOREVER." I remember feeling this way when I made my first quilt. 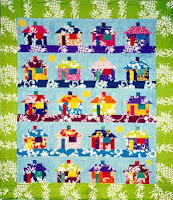 It was a Eleanor Burn's Quilting in a Day "Log Cabin" quilt. I remember so vividly those strips of fabrics piled up to the left of my machine and the excitement I felt sewing those strips together. Something clicked for me; something primal or spiritual, or ? 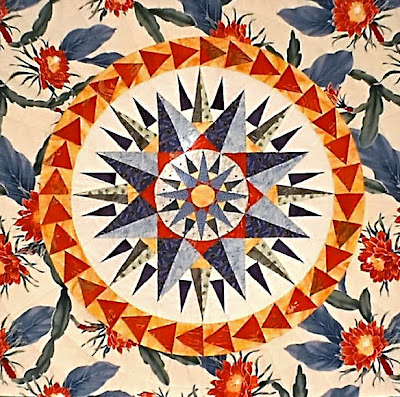 It was as if quilting was already a part of my soul, waiting for me to discover it. That's how I feel about aprons. The shape, the function, the femininity, the work ethic it implies, the frugality, the connection with my ancestors, the rick rack, the ties and the buttons! Hello, part of my soul. I'm sorry it took me so long to stumble upon you. Yes, I'm a nut job. But you knew that. Brrrr!!! Can you feel the chill in the air? It's in the mid-seventies instead of the high seventies. I've had to switch from my usual tank top to a short sleeve T-shirt! Luckily, I haven't had to close any windows yet, except the one by my bed at night. My other four bedroom windows can stay wide open for now. Hee hee. I'm mean, aren't I? This post was inspired by surfing my morning blogs and seeing all the wintery weather out there. I'll have to admit, I was a little jealous back in mid-December with all those beautiful snow pictures you posted, but now all I read about is how cold y'all are. So sorry, but I have to take this opportunity to gloat a wee bit. On Kauai, we have wonderful weather and fabulous beaches, but not much else. 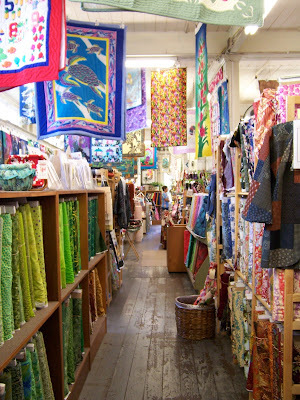 So when you Mainlanders blog about your grand thrift shops, fabulous quilt shows, giant discount fabric shops, local yarn stores (that actually have sock yarn...and wool yarn! ).....well, I get jealous. So here's my little bit of revenge. This is the view out one of my sewing room windows yesterday. 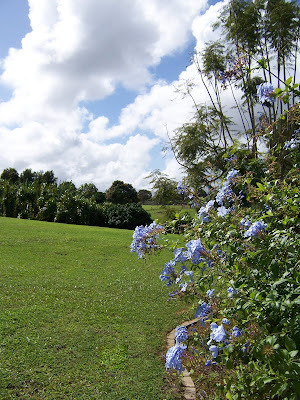 Sunshine, emerald green grass, warm balmy breezes, all on a sleepy little island waaaaaay out in the Pacific Ocean. I'm not jealous of your white Christmases any more. I'm only knitting ten rows a night on my Cable Rib Sock, but my thumb still complains every morning. I've been sewing instead of knitting lately; perhaps in tomorrow's post I'll be able to show you what I'm making. Time to get up and get moving. It's currently 75 degrees fahrenheit and the sun is shining. 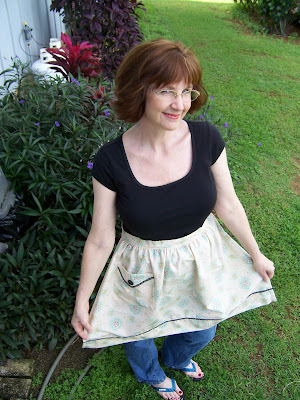 Time to get back into my sewing room. Unreal!, originally uploaded by dorkyquilts. Swimmies! 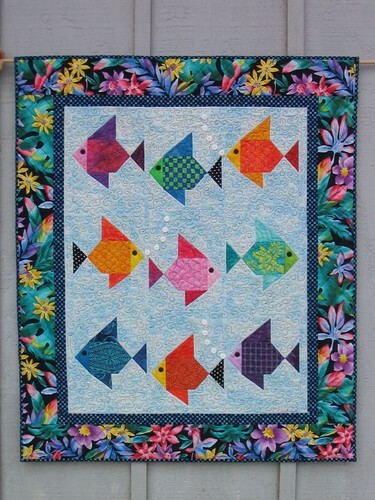 Fish Quilt by Lisa Boyer, originally uploaded by dorkyquilts. This is my original paper-pieced "Swimmies" pattern. I made this as a shop sample, so it's a smaller nine-block version of the my pattern. 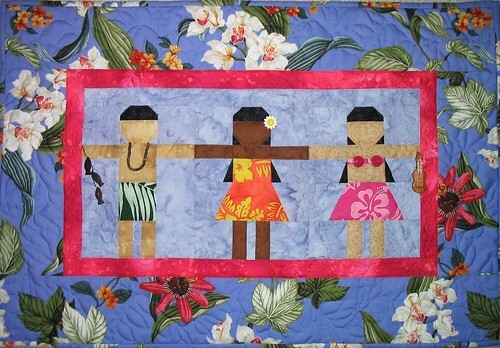 Keiki Hula Mini Quilt by Lisa Boyer, originally uploaded by dorkyquilts. I made this mini Keiki Hula for a store sample. Bright, isn't it? 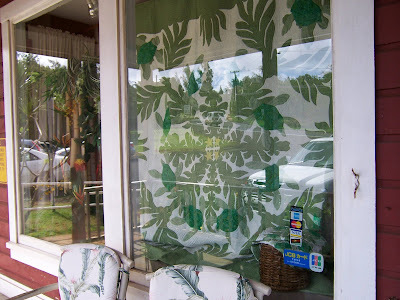 It took me several years after I moved to Kauai to start using these bright fabrics, but if you've ever visited a fabric store in Hawaii, you'll understand why quilt samples have to be so bright. 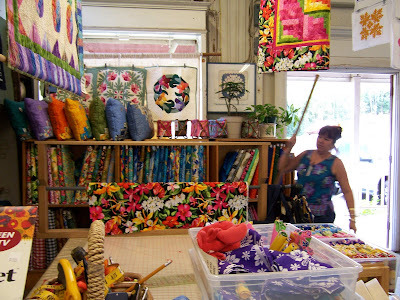 The stores are a riot of color! 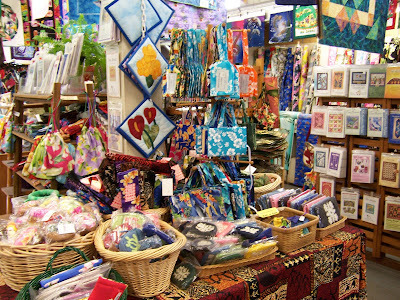 Rows and rows of Hawaiian prints and batiks and brights--if you don't compete color-wise, your quilt is destined to be a wallflower. I've made "tasteful" quilts with subdued colors for class samples and when displayed at Kapaia Stitchery--they look like sun baked mud next to all the retina-burning samples. 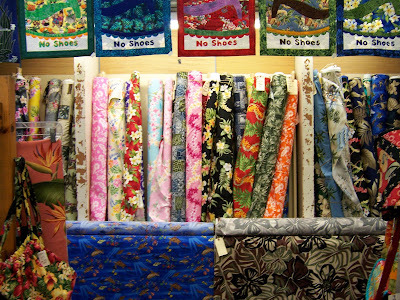 It's a tough quilt world here in Hawaii, baby. Gotta compete. Ouch. My Bed, originally uploaded by dorkyquilts. A picture of my bed. So soft. I like beds that make me sleepy just by looking at them. 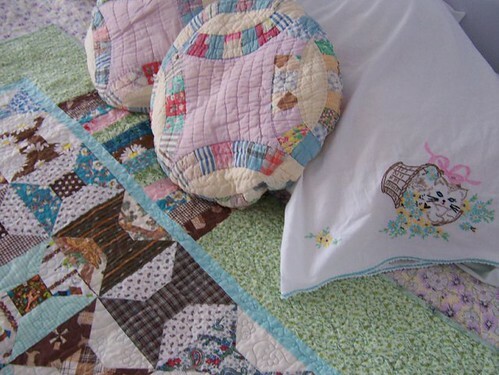 No exotic or beautiful quilts here--just soft and dreamy. My friend Anne from Kuopio, Finland...she da bomb! She knows what I like. Chocolate...or at least I think it is. I can't really read the box, but it sure tastes like chocolate, and that's good enough for me. She was also sweet enough to send me a calendar with lots of snow in it. It's very fun to look at, although it has more months with snow in it than someone on Kauai could fathom. It'll be fun to look at while I'm sweltering in the summer. The chocolate, however will not last until summer. Thanks, Anne! It started out to be a small rug, really. But I chose the wrong yarn and it's too slippery and drapey for a rug. Honestly, the thing is so slinky that I can't even coax it to lay straight. I used Knit Picks "Shine"--which is a lovely cotton yarn for garments--but not the sort of thing you need to make a rug or an afghan out of. I've thought of sewing some sort of twill tape or stabilizing thing around the edges, but that would just be adding more effort to a thing that I should've given up on waaaay before I sewed all the blocks together and added the crocheted border. I just kept thinking: "One more round of crocheted border on this thing, and it'll lay straight!" Nope. So I have another "thing" for the cat to sleep on. 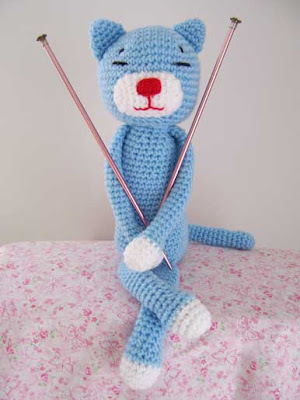 The cat is the recipient of many of my failed objects, whether quilted, knitted or crocheted. Unfortunately, he refuses to sleep on any of them, which makes me feel like a COMPLETE failure. Meh. "Sorry! I'm just a plain ol' carpet cat." Since I took up knitting less than a year ago, I've been asking my son if I could please, please knit him something. Wouldn't he like a nice, warm knitted alpaca hat for those frosty cold days at Washington State U? How about some toasty wool mittens? Socks? Slippers? Size: my scarf measures around 75" when all stretched out (but it shrinks up a little when actually worn). When wrapped around a 6'3" man, it gives them plenty of wrapping length. See step 12 to make an approx. 60" scarf. Stitch pattern: entire scarf is done in K1p1 ribbing with a slip stitch edge. Slip the first and last stitch purlwise of every odd row so that the colors don't go wonky on the color change row ends. 1. CO 49 stitches loosely; or however wide you want. This is my first written pattern; please let me know if I made a mistake. So how did I get my knitting injury (see post below)? On this project, I was determined to learn how to knit continental style. I was already comfortable knitting in continental, but purling was awkward and I tended to switch back to English style to purl. I figured that this scarf--six plus feet of ribs--was a good way to practice switching back and forth between knitting and purling, all in continental style. I only had two pre-Christmas weeks to finish it, so ignoring my hand cramps and slowly numbing thumb, I soldiered on. Knitters everywhere, this is not the thing to do. Don't ignore your screaming thumb tendon. Having been without a functioning thumb for a couple of weeks now, I can now appreciate the usefulness of my miraculously magnificent opposable thumb in a whole new light. I am sorry, my thumb. I am sorry I abused you. Please come back. Don't make me sew another clown blouse because I can't finish my other Cable Rib Sock. I made a blouse. No, seriously, I did. Those who have read my books will be amazed. After all, I whined profusely about set-in-sleeves and other three dimensional sewing projects and vowed never to sew anything but flat stuff ever again. I suppose it was my new-found love of zippered pouches that made me wonder if I actually COULD sew anything but flat stuff ever again. (And as you can see, I had to take a break from my frenzied knitting because I developed a knitting injury--more about that tomorrow.) So I bought this pattern that looked like it might possibly have enough room for my DD chest and made this up out of some $2/yard fabric from Wal Mart. Con: I wear a size 8 in clothing. This does not mean I could buy a size 8 pattern. These pattern people seriously believe that I am somewhere between a size 12 and a size 14! Honestly, Pattern People, take a basic course in psychology or read a women's magazine sometime. Women do NOT want to buy a pattern if they have to buy a bigger number than the size they try desperately to stay within range of. To add insult to injury, my bust measurement puts me in the circus freak zone of the pattern charts. I hate that. Con: Could you please, Pattern People, remind me...no...warn me how important those little matchy-uppy dots are before I decide that I'm so experienced a sewer that I don't need any of your stinkin' made-for-wimpy-non-quilters matchy dots? My entire blouse skews slightly to my left. Pro: I MADE A BLOUSE!! And as badly as it fits, I've been wearing it almost every day. Even though it's too gappy, tight, short, and made out of crummy waste fabric that looks like recycled clown pants...I MADE A BLOUSE!!! Happy, happy, happy. I'm 49 years old and I still can't figure me out. Yesterday , I decided it was time to clean up the mess I made during the Christmas craft frenzy. I'd been putting off cleaning until my son flew back to college, my thank-you notes were written, my email was answered. I could put it off no longer. It took me THREE FREAKIN' HOURS!!!! I need to learn to craft like I've learned to cook--clean as you go. Somehow, it's hard to apply the same discipline to crafting! 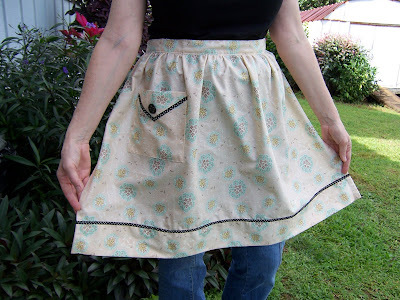 I think I've just made my first resolution for 2008: Clean as you sew.